DLF Place is a lavish shopping galleria that offers the best of food, fashion, beauty and entertainment. With international mix of leading fashion, food and entertainment brands such as Marks & Spencer, Forever21, Vero Moda, MAC, Forest Essentials, Anita Dongre, Chili’s, Smoke House Deli, Cafe Delhi Heights, DT Star Cinema, it forms a shopper’s paradise. The mall is located in the heart of Saket, and hence has an affluent catchment of Sec A and above category of shoppers. With the advantage of surrounding malls, Saket forms for a shopping destination. DLF Place has an attractive tenant mix across different categories of food, fashion, entertainment and beauty brands. The lease period is between three to nine years along with a few short term leases. DLF Place houses leading international brands covering about over 70 per cent of the leasing area, the remaining about 30 per cent is occupied by sought after national and regional brands. Also, the mall is popular for its food and entertainment offerings. Food brands take up to about 30 per cent space, while about 18 per cent space is dedicated to entertainment including DT Star Cinema and kid’s play zone. Both online and offline marketplaces operate in their own spaces and occupy the pie. There are some critical elements which are only possible in an offline space, including the touch, feel and trial opportunities besides many experiential elements. 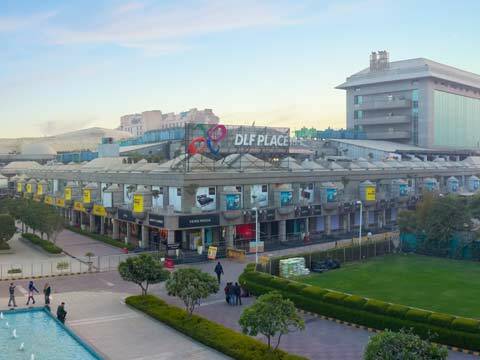 DLF Place, Saket has been known for its unique shopping festivals, first ever mall loyalty programme-Place with Benefits which truly rewards the patrons, exciting regular events, while engaging with children. Seasonal concept decor of the mall also forms attraction. Additionally, we are very active on all digital mediums with a very healthy fan base and engagements. Restructuring and zoning of brands besides an introduction of a better tenant mix is in the pipeline. Total Retail Area: 5,19,782 sq ft.